His career stretched from the twilight of the Hudson River School to the rise of American Modernism. If history had not caught William Merritt Chase in something of a vise, and if he had not been such a wide-ranging master of the brush, he might be far better known than he is today. Chase (1849-1916), acclaimed in his lifetime on these shores and internationally, was often brilliant, sometimes daring and always assured. He could paint interiors, portraits, landscapes, urban park scenes and still lifes. He painted like an Old Master, a realist and an Impressionist. He was renowned as a teacher, counting Edward Hopper, Georgia O'Keeffe, Marsden Hartley and Charles Demuth among his many pupils at several art schools. But Chase, whose career stretched from the twilight of the Hudson River School to the rise of American Modernism, was seen as a threat to the former and resistant to the latter. Labeled an eclectic, he receded into the background of art history. "William Merritt Chase: A Modern Master," presented here at the Phillips Collection (and traveling to the Museum of Fine Arts in Boston in October and then to the International Gallery of Modern Art in Venice), should help return him to the limelight. Filling several galleries painted in deep blues, this retrospective of some 75 paintings and pastels, the first in more than 30 years, reveals Chase as an artist who clearly absorbed the genius of Velázquez, Van Dyck, Manet and others yet made his own distinctive works. The centerpiece of the introductory gallery certainly advertises his potential. In his late 20s, after about six years of study in Europe, mostly in Munich, Chase unveiled "Ready for the Ride" (1877). This bold portrait of a woman dressed in shades of black harks back to Rembrandt but is contemporized through her well-modeled face, direct gaze and independent stance. Chase soon returned from Europe to take a teaching position in New York, where he strode around wearing bespoke clothes and a carnation in his lapel. He created a grand studio—combining two large rooms—in the Tenth Street Studio Building, which he filled with plush furniture, Old Master and Japanese prints, jewelry, decorative objects, textiles, stuffed birds, musical instruments, contemporary artworks and ethnic artifacts. He put these props to great use in the four works from the 1880s shown here, painted in loose, even flashy style. Rather like personal-brand builders of today, Chase believed that his flamboyance would aid his career. That sense overflowed into his works, like the vibrantly colored "Portrait of Dora Wheeler" (1882-83), which sets his subject in a dramatic diagonal pose against a luxuriously embroidered gold silk tapestry. It won him a gold medal at an 1883 exhibition of contemporary art in Munich. Two later portraits are more stunning. 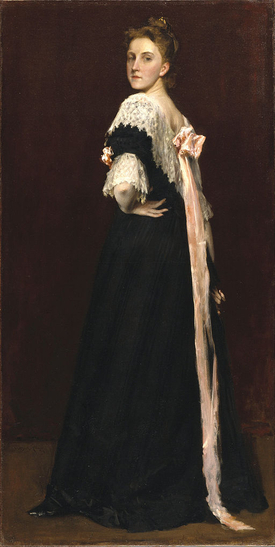 "Lydia Field Emmet" (1892) portrays his subject in a black, lace-trimmed velvet dress with a giant pink bow and ribbon streaming down her back to the floor. She stares at the viewer, hand on her hip and elbow haughtily pointed out. The softer yet also seductive "Portrait of Mrs. C (Lady With a White Shawl)" (1893) shows an elegant, aloof and perhaps ideal woman. In both, Chase mixes pose, contrast, texture and detail into grand visions of American womanhood. Chase was all about creating beauty, and perhaps the most beautiful portrait here is hardly one at all. "Spring Flowers (Peonies)" (completed by 1889) depicts a woman turned toward a bounteous floral vase, with just a sliver of her delicately featured face in view. Chase echoes the blooms in the fallen petals of the design on her kimono and does the same with the waves and flowers of the drapery and the design of her fan. Surprisingly, Chase used pastels for this large work, magically blending them to look like oils. While Chase advocated painting from life, he experimented with perspective, angle and structure. He told his students to compose as if looking through the view-finder of a camera and, sometimes, to reject the most picturesque in favor of the more interesting. In paintings like "Hide and Seek" (1888), "Shinnecock Studio Interior" (1892) and "The Lone Fisherman" (c. 1892), he follows his advice, leaving blocks of empty space in the foreground or choosing an odd angle that draw a viewer in for closer looks. Chase was a painter of light, too, which is evident in his Impressionist work, "At the Seaside" (c. 1892). Another fabulous example here is "Sunlight and Shadow" (1884). 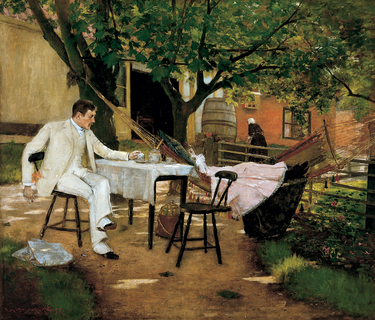 This sun-dappled scene shows a man in a three-piece white suit, sipping tea, while a woman dressed in pink rests in a nearby hammock. The man seems tense—Chase originally titled the picture "The Tiff"—but it's the play of light passing through the trees, the feel of a summer day, that makes it a great composition. The last gallery presents a few examples of the works many people most associate with Chase: his dramatic, straight-on depictions of dead fish, created to show he could make any subject appealing—or at least intriguing. They shimmer in the light, proving him right. Was Chase "modern," though? By its end "William Merritt Chase: A Modern Master" proves that he was modern enough, without becoming a modernist. The many virtuoso works on view, painted with brio, also confirm that the rest of the title rings true.